Some people look at a PC with a 2080 ti and think, “Wow, that’s impressive”, while others think to themselves, “yeah… but what if it had two?”. If the latter of these sounds more like you, then a full tower case might be a good fit. Full tower cases are, ostensibly, about excess. As such, they are made to fit and cool tons of high-end hardware. For this same reason, they are hands down the best options for over the top gaming machines and workhouses. 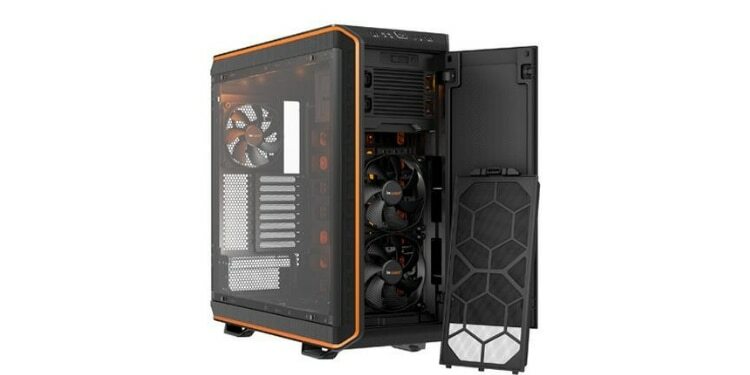 To help you find the best full tower case for your needs wants we’ve rounded up our top five picks and reviewed each one. The Corsair 1000D is a monstrously large case that flaunts some unique capabilities, including the ability to house two full systems. On the main motherboard tray, you can mount practically anything up to an eATX motherboard, while on the PSU shroud you can build an entire second mITX system. This includes a second power supply, second I/O, everything. This is nearly the largest PC case on our list and is very spacious even with two full computers worth of hardware inside. All this space can be put to good use though with room for up to 18 fans or two 480mm radiators. This staggering level of cooling makes this arguably the best full tower PC case for water cooling enthusiasts and overclockers alike. Setting up all of these fans is made even easier thanks to the telescoping fan and radiator mounts. These mounts are large plastic racks that slide in and out of the front and top of the computer and allow easy access to mounting points for fans and radiators. The 1000D also offers excellent cable management with a spacious three chamber design for easy access to cable runs behind the motherboard tray. Finally, this case is also probably the best looking full tower gaming case thanks to the tempered glass panels on the front, both sides, and top. All this glass allows this case to truly shine-- quite literally-- when in the hands of an equally excessive RGB fan. That being said, the massive amount of glass and steel cause this case to weigh a whopping 65 pounds, so make sure you have a sturdy desk to put this beast on. And remember to lift with your knees. While some people may be in the market for an ATX full tower case to ensure they have the best gaming setup on the block, others need it to get real work done. These large cases often lend themselves to editing workstations that have to do a lot of rendering. If this is the case for you, then the be quiet! Dark Base 900 is a productivity powerhouse. This case is highly modular and allows for all sorts of internal layouts and configurations. There is even the ability to completely remove the motherboard tray, flip it around, and make a PC with an inverse layout (graphics cards at the top). Even the power supply can be top mounted if so desired. This modular design offers tons of flexibility and storage space options. The back of the motherboard tray has a single mounting point for a 2.5” drive and there are an additional seven drive bays included with the case. Each of these can hold either a 3.5” drive or two 2.5” drives for a potential total of 15 solid state drives. This would be great for potential media center PCs or home servers. be quiet! also lives up to their name with this case including three of their impressively quiet Silent Wings 3 fans. The case is also generally designed to reduce noise with its specially designed intakes. Moving on to this case’s weak points, you’ll notice it doesn’t have any window on the side panel, which is a little disappointing. Also, the power supply uses a strange recessed pass-through mechanism that, while not necessarily difficult to install, does seem unnecessary and will add about 10 minutes to the build process. The Thermaltake Tower 900 is hands down the biggest PC case on our list and sports a unique layout. 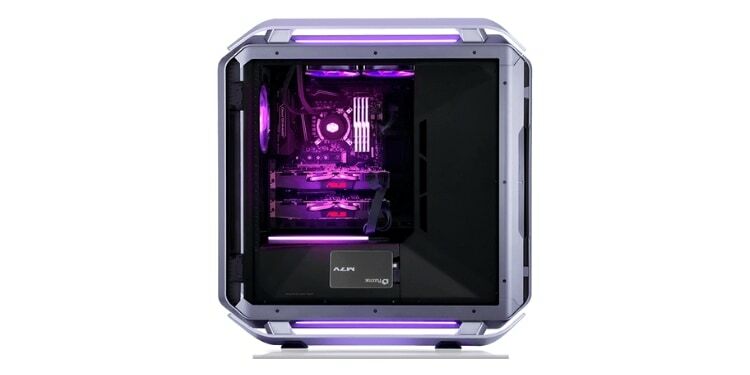 Rather than being shaped like a normal computer case that has a window on the side, the Tower 900 looks more like a high-tech mini fridge that has tempered glass on the front and sides. This unique layout lets you have easier access to your hardware when all the glass is off and also does an excellent job of showing off what's inside. This massive case has enough room for an eATX board, vertically mounted graphics cards, and two full water cooling loops. There are mounting points in the front of the case for two separate reservoirs while their pumps can be stored in the cable management area underneath. Meanwhile, in the cable management area in the back, there is room for up to two 560mm radiators. This is by far the most radiator space of any case we’ve seen. In fact, radiators this size are pretty hard to come by. That being said, the case’s radiator capacity depends on how many drives you need as many of the drive bays are also in this rear cable management area, and will need to be removed in order to fit 560mm radiators. If a massive full tower computer case sitting on your desk just isn’t eye-catching enough, there is a way to increase the gaudiness of your build. It comes in the form of the most important acronym in PC gaming: RGB. 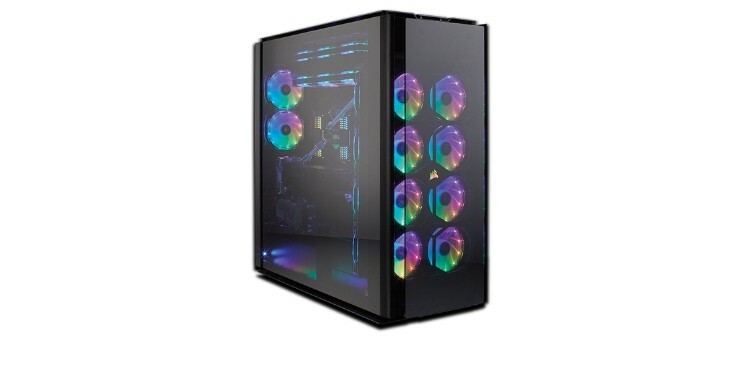 The Cosmos C700P from Cooler Master is probably the single most radiant full tower case on the market thanks to its two tempered glass windows and built-in RGB lighting around the top and bottom of the case. At the top of the case next to the I/O are a couple of buttons for changing the light color and animation as well as fan control. From the button on the top of the case, you can either set your fan curve to high for things like gaming or low for nice quiet Netflix watching. Despite its impressive looks, this case does have some major downsides. The Cosmos C700P is made from mostly aluminum and glass which give it a premium and durable feel, but adds significantly to the cost. Also, this case is extremely lacking in storage capacity, only able to take up to four drives; there are some SFF cases that can accommodate more than that. The case has extra room for more bays, and Cooler Master does sell additional drive cages separately, but these are actually very difficult to find and are often sold out. If you’re on the hunt for the best cheap full tower case then we recommend taking a look at the Phanteks Enthoo Pro. This case is by far the most affordable on our list and boasts features that are usually only seen well above its price point. For the price, the cooling is very impressive. 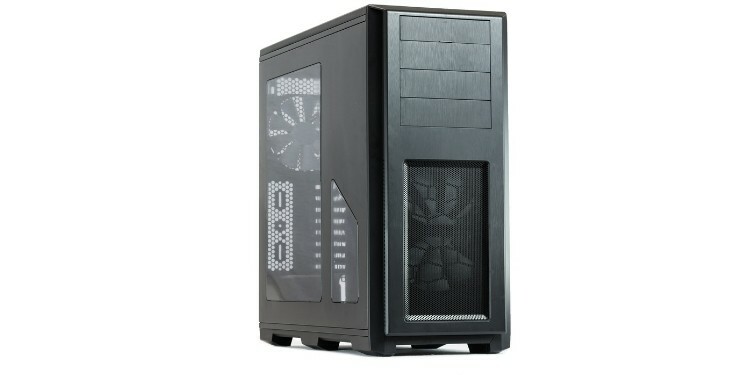 The case comes with a single huge 200mm fan in the front as well as a 140mm fan in the back. Together these produce ample airflow to cool just about any component you could plan to put into this case, even multiple graphics cards. This case also has room for plenty of water cooling and can fit up to four different radiators of up to 360mm. The case has an overall plain brushed aluminum looking finish but there is an upgraded version with a side panel window for only a few bucks more. Picking a full size tower to house your hardware gives you significantly more freedom than smaller cases. These king-sized cases are designed to accommodate very large motherboards referred to as eATX or sometimes even XL-ATX. Unlike regular ATX motherboards and some of the other smaller standards, these terms don’t have a precise meaning but rather simply indicate that these boards are a step up even from ATX. The advantages of these massive boards usually include more PCI-E and RAM slots. This means these cases really lend themselves to workstation type computers that can utilize multiple graphics cards while rendering and which eat up tons of RAM as a result. There are a lot of things to consider though before buying a full tower case, so let’s look at a few of the most important things to keep an eye on when shopping for a full tower case. As you might expect, full tower cases are often preferred by water cooling enthusiasts. The spacious interiors of the cases make it easy to find room for large reservoirs, pumps, and radiators and the more open airflow make cooling much easier in general. Cases like the Corsair 1000D are great for those who plan to use air cooling on their equipment thanks to its excellent airflow paths and ability to hold up to 18 fans. While practically all the cases on this list are more than ready for water cooling loops, the best example of this would be the Thermaltake Tower 900. This case can host two separate water cooling loops and even has room for up to two massive 560mm radiators. This is easily enough cooling to get some impressive overclocking done as well. Another big reason people use full tower cases is for their superior storage capacity. If you have a media center or home server where you store tons of movies, games, or other files, then a full tower case could be an excellent expansion option if you find you are often running out of space. There are typically three types of drive bays you’ll find on a case. 5.25” bays are for things like CD readers and even floppy disk readers. 3.5” bays are for more traditional hard drives that are a bit slow but offer excellent value for the amount of space they have. 2.5” bays are typically for solid state drives, which are much faster but significantly more expensive. If you’re looking for a case that offers tons of drive space, then the be quiet! Dark Base 900 is an excellent option. It is highly modular which lets you easily adjust the layout of the case to suit your needs, but by default, it comes with seven drive cages. Each of these cages can hold either one 3.5” drive or two 2.5” drives. This alone easily gives you enough for 14TB+ of storage plus expandability is supported with the purchase of even more drive cages. The last thing to touch on is the ports available at the front of the case, or front I/O (in/out). Depending on your setup and needs this might be more or less important for some people but it is important to take a look at before making your final choice. There are three main ports to look for. USB 2 is an older form of USB port that can only handle 480Mb per second of data transfer. This this is fine if you only plan to plug mice or keyboards in, but it is not ideal for those who often transfer files onto and off of thumb drives or cameras(like in the case of a editing workstation computer). USB 3, on the other hand, can handle speeds of up to 5Gb per seconds. This is more than 10 times as fast as USB 2 and is much better for transferring any kind of HD files between devices. Finally, the most modern cases and devices will have USB type-C which is a different connector than older USB ports, but can transfer files at a blazing 10Gb per second and is the best choice for people with new Android phones that already use this type of port. What Is The Best RX 580 Graphics Card For 2019?